Henry Lewis was one of the first explorers who began to travel the upper Mississippi River in the mid-nineteenth century to admire the exuberance of its cataracts. In summer 1847 this painter of English origin established in Saint Louis paid his first trip along this fast-flowing river in a steamboat from Fort Snelling and the Falls of Saint Anthony to New Orleans, making abundant sketches. 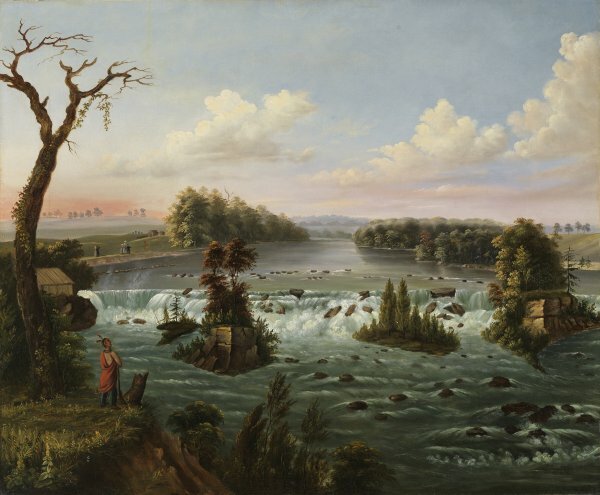 The following winter he completed a large number of views of the river at his Saint Louis studio, among them the Falls of Saint Anthony, Upper Mississippi in the Thyssen-Bornemisza collection. Although many other artists also painted panoramic views of the mythical river, Lewis was the first to produce a monumental panorama, Mammoth Panorama of the Mississippi River, executed in Cincinnati in 1849, which was shown in several American and European cities with the aid of a special device that slowly unrolled it while a presenter gave a description. In 1854, while in Düsseldorf, Lewis published Das Illustrierte Mississippithal, an account of his trip accompanied by his own sketches which is now among the most treasured publications on the exploration of America. It is also interesting to note that Lewis based the Falls of Saint Anthony on a number of meticulous, realistic sketches acquired from Seth Eastman, a soldier-painter of the Dakota and Chippewa Indians and of the scenery of the Mississippi. The somewhat naïve minute detail of the topography of the spot also recalls the painting of his contemporary George Catlin. This painstaking attention to detail can be seen in the figure of the Indian sitting in front of the rapids, whose painted face and feathered and jewelled adornments can be distinguished, despite his minute size.